TORCH LAKE living at it's finest! This turn key, waterfront, maintenance free, wonderful 4 bedroom, 3 bath home with 2 wood burning fireplaces, has recently been completely redone with Paradigm windows, Anderson door walls, granite kitchen and bath counter tops, custom kitchen cabinetry, stainless steel kitchen appliances, hardwood flooring, carpeting, baths, showers, composite maintenance free decking, railings and outside stairs and more! Home is located at the end of a dead end street for even more privacy! Home is ready to move in to and totally maintenance free and includes the waterfront dock! 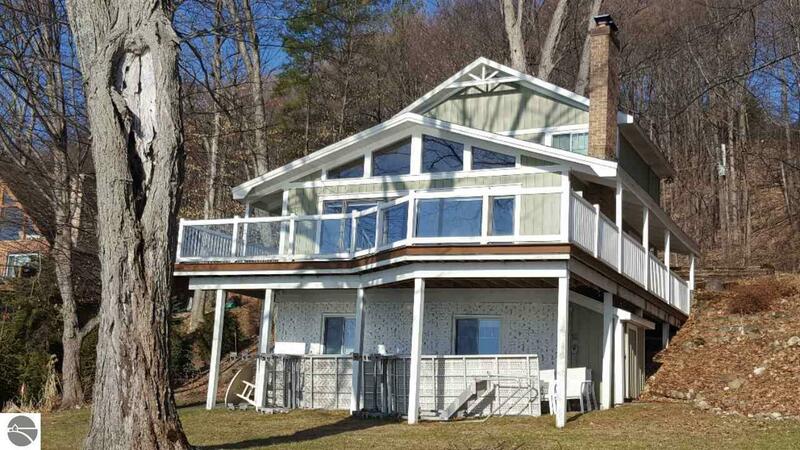 So, if you're looking for the perfect secluded spot on the lake that you can just move right into, this home is for you!! Bedroom 1 Size: 10'2" x 10'5"
Br2 Size: 12'4" x 11'6"
Br3 Size: 11'6" x 11'6"
Br4 Size: 11'9" x 9'11"
Din Rm Size: 14'6" x 9'0"
Fam Rm Size: 22'7" x 14'6"
Kit Size: 12'5" x 7'6"
Liv Rm Size: 14'6" x 14'10"